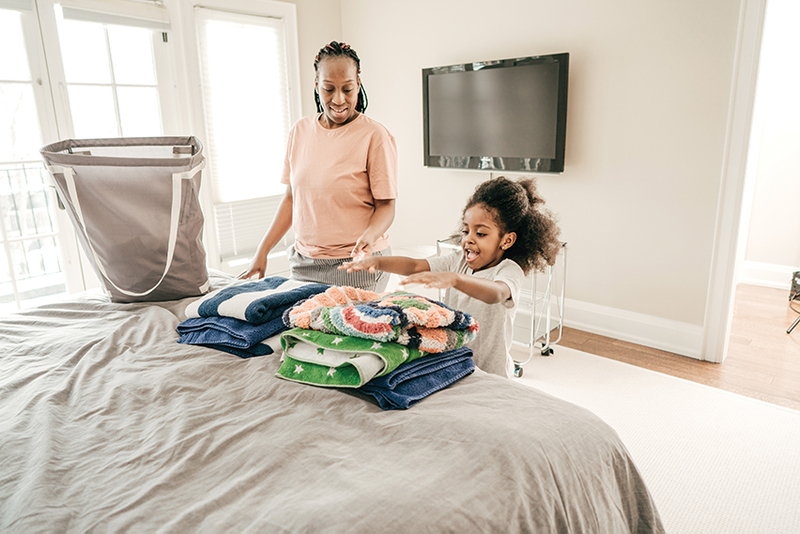 A young child’s relationships and interactions with the important adults in her life have a great impact on her early brain development and ongoing learning. For most children, family members are the primary caregivers who provide this important foundation. When children enter preschool programs, strong partnerships between home and school can support positive family relationships and promote learning at home. One way to encourage positive connections within families is by teaching adult family members to use the Powerful Interactions™ framework with their children. Developed by Amy Dombro, Judy Jablon, and Charlotte Stetson, this approach encourages early childhood educators to intentionally create opportunities to interact with young children. 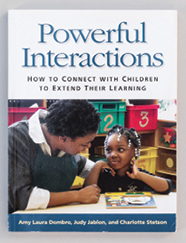 (Read more about it in the book Powerful Interactions: How to Connect with Children to Extend Their Learning.) We think it works so well, we want teachers to inspire primary caregivers—moms, dads, aunts, uncles, grandparents, anyone!—to use it to support interactions with their young children at home. Mrs. Lopez walks her son, Danny, into his preschool classroom, ready to start the day. She talks with Melanie, Danny’s teacher, about how hard it is to get Danny to read library books with her at home. He doesn’t seem interested. The previous evening, the experience ended with Danny in tears: He wanted to keep playing with his superheroes rather than read together. Mrs. Lopez wonders how she can make reading together a more positive experience for them both. Melanie listens attentively, thinking about ways she can support this family. She considers what positive interactions she can suggest that center on early reading. 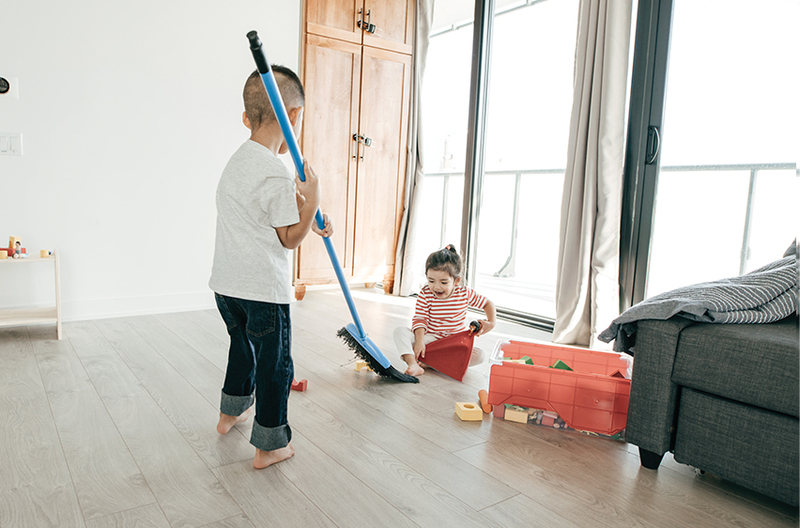 Families know their children’s routines, interests, and abilities. They can use this knowledge to incorporate learning opportunities during everyday activities (getting ready for school, riding in the car, bath time). A meaningful learning opportunity occurs when a child adds new information or skills to what she already knows. The new information should be developmentally appropriate, interesting to her, and understandable and useful across different situations. For example, a child who loves painting may already recognize the colors blue, green, and yellow, but she may not know that mixing together blue and yellow creates green. Empower families to use the Powerful Interactions framework to support their children’s learning in a variety of areas, like literacy and math. Meaningful learning opportunities can happen during any activity, and they don’t need to feel forced or overly educational. Families can support math learning while doing chores (sorting laundry into darks and lights) and cooking dinner (measuring ingredients). They can support literacy development while riding the bus (pointing out and reading signs) and shopping at the grocery store (reading labels out loud to the child). Encourage family members to be relaxed and to keep learning fun. In our program, we created family workshops focused on different elements of early literacy, including phonological awareness and the alphabetic principle. Each workshop session included time for participants to talk about opportunities during routines their children enjoy (bath time, playtime, driving in the car) and a discussion of ways to powerfully interact with their children during those times. Families thought of ways children could listen for and identify sounds during a walk to the playground (phonological awareness) and make letters with water crayons in the bathtub (alphabetic principle). They also came up with different questions adults could ask about a child’s day (comprehension/vocabulary). After our workshops, we were deeply inspired by the positive results. Parents reported feeling that their interactions with their children were valued, respected, and appreciated. They were eager for more opportunities to positively engage with their children. One mother shared, “We don’t often learn how to interact with our children and then practice it. This has been great.” Families also shared that they were beginning to understand how interactions, such as having conversations, contributed to later academic success. Make time to introduce Powerful Interactions (family workshops, family–teacher conferences). Use multiple occasions and different formats to share and reinforce information about Powerful Interactions and the framework (on the class website, in printed handouts, during drop-off and pickup chats). Model Powerful Interactions between teachers and children whenever possible, like during drop-off and pickup times, special family–school events, and when parents are volunteering in the classroom. Think about how the framework might work best for each unique family and community in your classroom. During her next opportunity to talk with Mrs. Lopez (at a parent–teacher conference), Melanie thanks her for sharing her struggle to get Danny to read books with her. Melanie tells Mrs. Lopez she would like to work together to make things less frustrating. She brings up the Powerful Interactions framework. Later that night, Mrs. Lopez finds Danny playing with his superhero figures on his bed. She listens as he has them talk to each other, planning their next adventure. Sitting down next to him, she picks up one of the figures. She starts thinking about how the superhero she holds could add to the conversation (Step 1: Be present). Danny is thrilled to continue planning the adventure and play with his mom. They have the superhero figures talk and help people together (Step 2: Connect). When it’s time for Danny to go to sleep, Mrs. Lopez asks him if they can continue playing together tomorrow and maybe even write down and draw their adventure plan. Danny nods enthusiastically and begins to share what the superheroes may end up doing (Step 3: Extend learning). We hope all preschool teachers present this approach to the families of children in their programs. It’s a great way to partner with parents, promote positive family relationships, and extend children’s learning. At the same time, teachers can help family members feel appreciated and aware of their important roles in children’s learning and development. Put aside all the tasks you need to do (laundry) and any feelings that may distract you (concerns about a work deadline). Give your full attention to the child. Observe what the child is doing (stacking blocks), listen as he talks to you (“I made a tower.”), and let him know you are interested in and focused on his play (“Great! It is very tall.”). When the child shares with you, build on his interest and think of ways to make connections that help him learn. Find questions to ask, comments to make, and activities to do together that show your interest and expand his thinking and learning (“I wonder how much higher the tower can go.” “Let’s count the number of blocks in your tower.”). Helping families engage in these steps encourages the positive interactions already taking place in the home. It also offers ideas for more ways primary caregivers can meaningfully connect with their children. 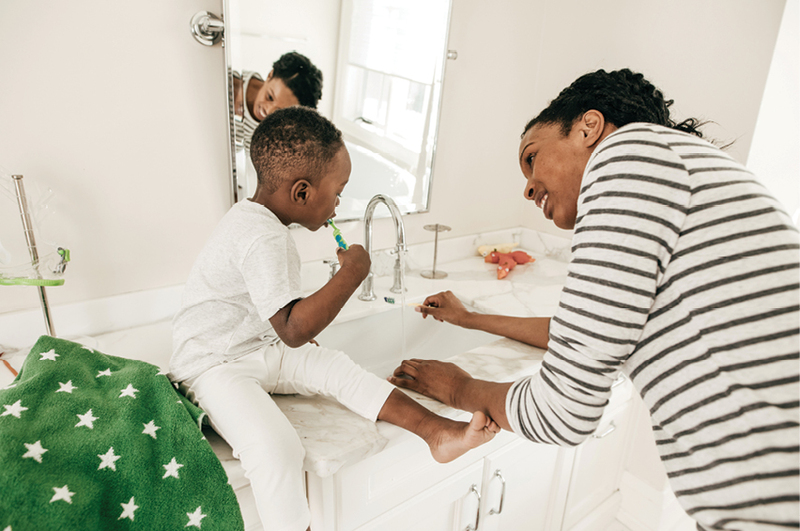 If finding one-on-one time with children is challenging, encourage families to use everyday routines (making dinner, cleaning, traveling) as times to interact with their children. Powerful Interactions can occur between a child and other family members or important people (older siblings, grandparents, babysitters). Families can engage with one child or with multiple children at once. A lot can happen in 10 to 20 minutes. Families can find ways to connect different learning areas (talking together and learning new words, storybook reading, drawing, writing stories) based on their children’s interests. It could be as simple as using crayons and paper or taking a trip to the library. Families shouldn’t feel like they need to spend a lot of money. It’s important to follow a child’s lead. 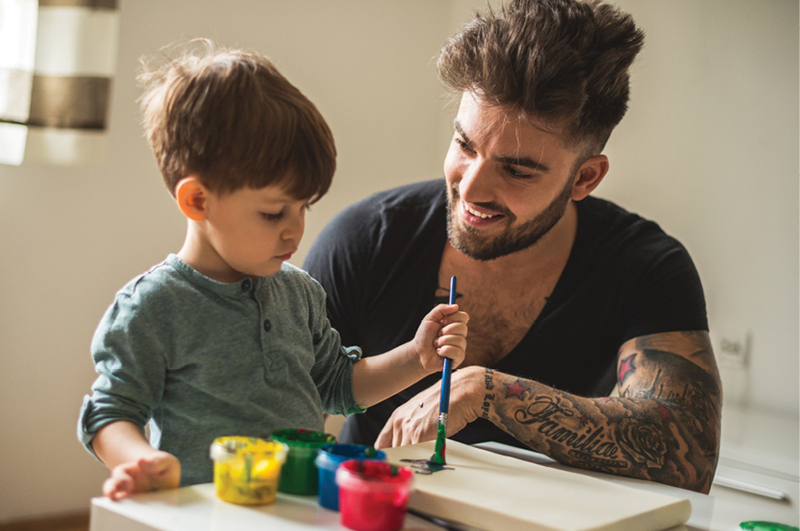 Families might hope to do a specific activity with their children (read a book together), but it’s okay if the activity goes in a different direction (talk about something on the first page of the book) or if a child needs to stop and come back to the activity later. Interactions should occur in a language that families feel comfortable and confident using to connect with their children. Using home languages with their children can lead families to provide more natural and meaningful learning opportunities. Families don’t need to make lesson plans or create complicated activities to help their children learn. Conversations, singing songs, dancing, and other familiar activities are great ways for families to engage with children. It’s okay if a child does not engage with or respond to his family during an activity. Families can always try again later or do something differently to see if the child then finds the activity more engaging. Families do not need to “test” their children at the end of an activity to make sure they have learned something. Instead, learning is extended based on children’s specific interests and abilities. This article was inspired by Powerful Interactions: How to Connect with Children to Extend Their Learning, by Amy Laura Dombro, Judy Jablon, and Charlotte Stetson (NAEYC 2011). Kristan Stewart-Henry is a student in the joint doctoral program in special education at the University of California, Berkeley, and San Francisco State University. Amber Friesen is an associate professor in early childhood special education at San Francisco State University.